This 12-day ocean cruise around the polar circle takes you deep into the breathtaking expanses of Antarctica! Experience the beauty of Antarctic Peninsula as you sail through the Beagle Channel, the Deception Islands and Drake Passage. We will sail through the Beagle Channel. Beagle Channel is a strait separating islands of the Tierra del Fuego Archipelago, Argentina. It separates Isla Grande de Tierra del Fuego from the islands Nueva, Picton, Navarino, Hoste, Londonderry, Stewart Islands and other smaller ones to the south. The Channel gets its name from the ship ‘Beagle’, in which the famous scientist Charles Darwin had done a survey of the region. One can also try out exciting optional activities such as Kayaking and Scuba Diving on this trip. 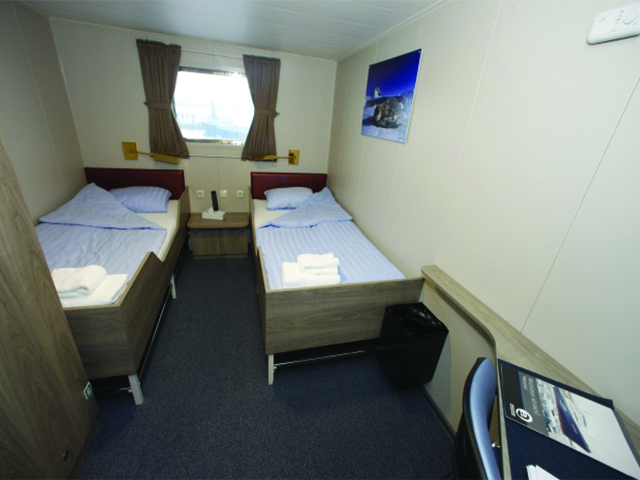 The next few days will be spent on our vessel, M/v “Plancius,” where you will be accomodated in twin sharing superior rooms. The next two days will be spent sailing across the Drake Passage. The Drake Passage or Mar de Hoces is the body of water between the southern tip of South America at Cape Horn, Chile and the South Shetland Islands of Antarctica. This passage connects the southwestern part of the Atlantic Ocean (Scotia Sea) with the southeastern part of the Pacific Ocean and extends into the Southern Ocean. Before the passage opened, the Atlantic and Pacific Oceans were separated entirely with Antarctica being much warmer and having no ice cap. The joining of the two great oceans started the Antarctic Circumpolar Current and cooled the continent significantly. Going further ahead, we arrive at the circum-Antarctic upwelling zone, as we cross the Antarctic Convergence. We will look out for Wandering Albatrosses, Grey Headed Albatrosses, Black- browed Albatrosses, Light- mantled Sooty Albatrosses, Cape Pigeons, Southern Fulmars, Wilson’s Storm Petrels, Blue Petrels and Antarctic Petrels in this region. As we approach the South Shetland Islands, you will experience the thrill of getting the first glimpses of icebergs. South Shetland Islands comprises a string of islands that stretch across 540 km that run parallel along the north western coast of the Antarctic Peninsula. They are located about 800 km from Tierra del Fuego and about 120 km from the Antarctic Peninsula. Most of these islands are glaciated and a few of them even known to be volcanic. The archipelago consists of 11 major islands and numerous smaller ones. These windswept islands are mountainous, and often shrouded in mist and fog; yet they offer quite a few subtle pleasures to the visitors. There is an amazing variety of flora which includes mosses, lichens and flowering grasses. The marine mammals consist of species such as such as Gentoo Penguins, Chinstrap Penguins and southern Giant Petrels. In olden times Seal hunters used to frequent the islands in search of Fur Seals which were almost completely wiped out of this region. Today, they are totally protected, and a few Fur Seals are can be found breeding around the South Shetland Islands. The Master of the vessel may decide to sail through the narrow English Strait between Robert Island and Greenwich Island if the conditions are favourable. We will then be in sight of Aitcho Island at the South Shetlands in the late evening of the third day. If the conditions do not allow us to manoeuvre through the English Strait then we continue sailing towards south of Livingston Island. We will spend a few days exploring Antarctica. We may start our first day in Antarctica with a landing at Hannah Point, on the south coast of Livingston Island. It is a favorite tourist destination mainly because of high concentrations Gentoo Penguins, Chinstraps and Southern Giant Petrels seen here, as well as Elephant Seals hauling out on the beach. It is one of the few places where a couple of Macaroni Penguins breed in Antarctica. Later on, we will sail to Deception Island. The ring-shaped island is in fact the top of a volcano, a caldera. Deception itself is a sub ducted crater, which opens into the sea, creating a natural harbour for the ship. Here we find hot springs, an abandoned whaling station, thousands of Cape Pigeons and many Dominican Gulls, Brown and South Polar Skuas and Antarctic Terns. In Whalers Bay the remains of an early 20th century whaling station can be seen. 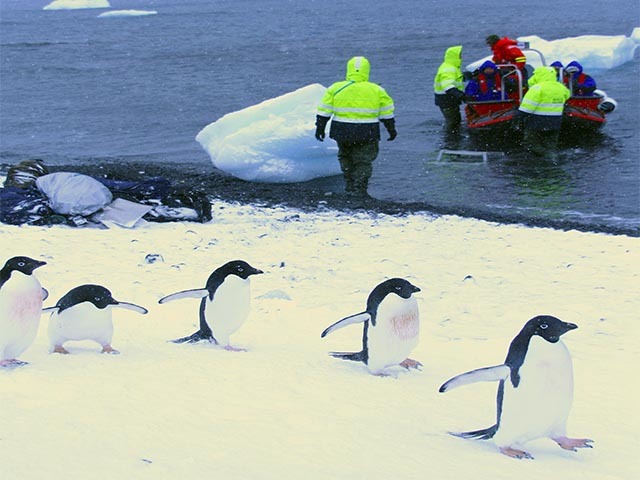 It is one of the safest harbors in Antarctica. We can spot the Storm Petrels nest in the ruins of the whaling station in Whalers Bay. If you want to indulge in some adventurous hiking, you can opt to hike from Baily Head over the ridge of the crater into Whalers Bay, while our ship braves its entrance into the crater through the spectacular Neptune's Bellow into the ring of Deception Island. On our way further South we will sail across the Gerlache Strait to Cuverville Island, a small precipitous island, nestled between the mountains of the Antarctic Peninsula and Danco Island. It contains a large colony of Gentoo Penguins and breeding pairs of Brown Skuas. In Neko Harbour and Paradise Bay, punctuated with myriad icebergs and deep cut fjords, we set foot on the Antarctic Continent. Here, we shall get a chance to opt for some adventurous zodiac cruising between the icebergs in the inner parts of the fjords. To add to the excitement, we may chance upon Humpback Whales and Minke Whales. We will sail through the spectacular Lemaire Channel to Petermann Island, where we can spot Adelie Penguins and Blue-eyed Shags. We will also try making a stop at Pleneau Island, famous for the Elephant Seals. We have a good chance of encountering Humpback, Minke and Fin Whales here. Next, we head south along the Argentine Islands towards Crystal Sound, south of the polar circle. The landscape is spectacular with very high mountains and huge glaciers. 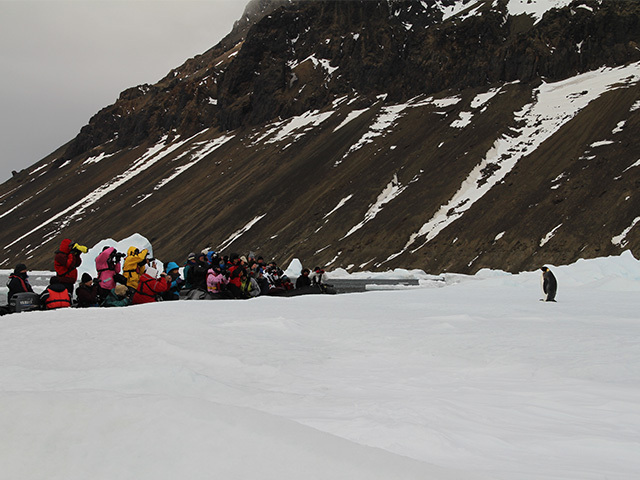 At the Fish Islands we land at one of the southernmost Adelie Penguin and Blue-eyed Shag colonies in the Antarctic Peninsula. The small archipelago of Argentine Islands is located at Latitude 65º south. The Ukrainian research station Vernadskiy (previously the British Faraday Station) is based on Galindez Island and is often visited. A visit to the base will show us how scientist live and work in the harsh Antarctic climate. At Detaille Island, south of the Polar Circle, in Crystal Sound we reach probably our farthest south. Sailing north through Neumayer Channel we will arrive at the Melchior Islands, famous for its beautiful landscape. 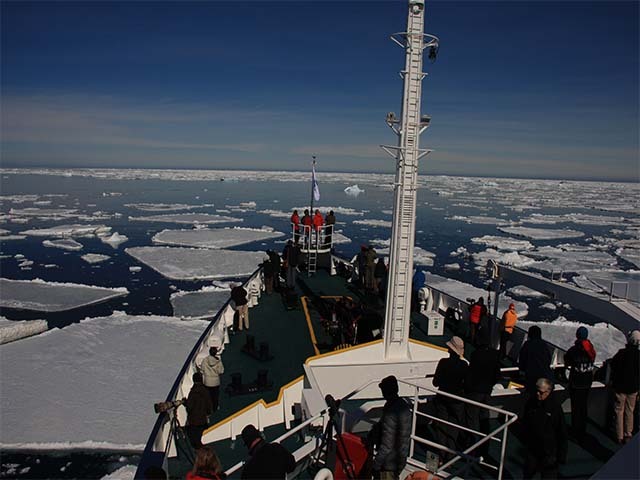 We can explore the possibilities for another zodiac cruise among the icebergs and even encounter Leopard Seals, Crabeater Seals and Whales. As we return to Ushuaia, we will spend the next two days in the Drake Passage, where we again get a chance to spot several seabirds. Our highly experienced lecture team will tell us more about the wildlife and the environment around as well as give valuable tips regarding adventure in Antarctic region. Please Note: A typical itinerary to the Polar Circle could be as above and should be treated as only a guide, not an exact program. Flexibility is the key to all our cruises and our exact route and program will depend on such factors as weather conditions, wildlife encounters, the experience of the Expedition Leader and the advice of the Master of the vessel and crew.